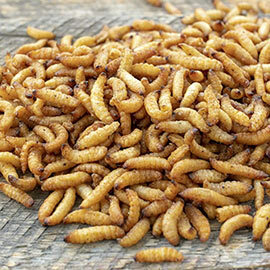 Selective Feeding is Better for the Birds—and You! Q: When should I stop putting suet in my feeders? I have filled them up all winter and have had lots of wanted visitors; and the squirrels have (mostly) been defeated by a greased pole! But should I still be filling the feeders now that it's getting warmer? The birds are still stopping by. Should I gradually stop? Any advice?" A. Lots of advice, Paula! Now; suet feeders are metal cages that hold little cakes of rendered fat. Once upon a time, they had to come down when the weather got warm because the suet could melt and get on the bird's feathers. But modern suet cakes (which often have treats like nuts and dried berries mixed in) resist melting and can be left up later in the Spring. 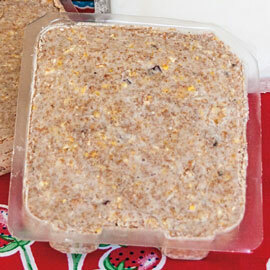 Oh--and there are also suet cakes 'flavored' with hot pepper powder that help keep Evil Squirrels at bay. Now, I suspect that Paula is picking up on some of our past conversations, as she pretty much describes my strategic method: Put out lots of suet feeders in the Fall, keep them filled over Winter and then stop in the Spring. Suet attracts the meat-eating birds that are great at controlling insect pests, like the chickadee, titmouse, nuthatch and all kinds of wonderful woodpeckers. The birds choose this food-rich area for their nesting sites over winter and then switch to eating insect pests in the Spring when the suet feeders become empty. It really works well. We have not put out any kind of food in the Summer for decades and our landscape is a riot of birds—especially this time of year when they're choosing mates and putting on great aerial displays. And speaking of mating, a very interesting article published a few years back in The Economist reported that Swiss researchers found that supplemental feeding interfered with mating. It made some male birds so "lazy" that they didn't start putting on their mating displays until long after the prime females had already been courted. And there are fears that supplemental feeding in late Spring/early Summer could interfere with young birds' abilities and instincts to find food in the wild. The Humane Society's website states that (and we paraphrase here to clarify the language) 'birds don't need your help in the summer when they're nesting and rearing their young; their focus is on eating insects. It is also important for young birds to learn how to find naturally occurring foods. So", they continue, "take a break from filling feeders in the summer. 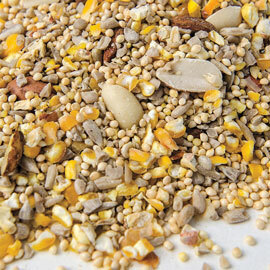 Bird feeding is most helpful in late winter and early spring, when natural seed sources are depleted." And here's a new bird-helping suggestion. When I recently spoke in Fayetteville, I stayed with family friends (hello Hanah, Adam and baby Philly!) and spent a lot of time in their backyard (the weather was great!). They had only recently moved into this house and the 'lawn' out back had some bare spots that were dry and dusty. While I'm sitting out there I must have seen four different birds fly down and roll around on these patches to give themselves a little dirt bath to get rid of mites—it was a much better show than they would put on at a feeder! Oh—and speaking of feeders, when should the suet stop? Essentially now—or even a few weeks ago. When the weather is warm enough that you see insects in the air. That's when the birds can move seamlessly from suet to flying pest.